Sear venison in a hot sauté pan on all sides. Place venison in baking pan and finish cooking in oven until medium rare, about 12 to 15 minutes depending on thickness. Remove from oven and let rest 15 minutes. Slice into very thin strips. Heat a sauté pan over medium heat. Add 2 tablespoons of the chicken stock, onion and shallots and sauté until transparent. Add garlic and mushrooms and sauté another 2 minutes. Add tomatoes and cook an additional 2 to 3 minutes. Add tomato puree, tomato paste and wine. Reduce heat and let simmer, uncovered, about 30 minutes. The finished sauce should be of a rather thick, spreadable consistency. While the sauce is cooking, bring a large pot of salted water to a boil. Add lasagna noodles and cook until al dente (still a little firm). Remove from pot and run under cool water to stop the cooking. Lay each noodle flat, not overlapping, on flat surface. Cover with plastic wrap. Remove stems from spinach. Rinse thoroughly and drain. In a large sauté pan, heat remaining chicken stock and lemon juice and quickly wilt the spinach, about 20 seconds, just until softened and bright green in color. This may need to be done in batches. In a food processor, puree ricotta cheese until smooth. Add cottage cheese and puree again. All the ingredients are now ready for assembling the lasagna. Uncover 1 lasagna noodle. Using a spatula, spread about 1 1/3 tablespoons of ricotta mixture halfway down the lasagna noodle. Top cheese with a layer of the spinach leaves, laid flat. 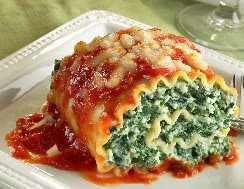 Add some of the tomato sauce and spread over the spinach. Add 1 ounce of the thinly sliced venison, per noodle. Roll the noodle from the end with all the ingredients to the empty end. Place on a baking sheet and continue rolling the remaining lasagna noodles. When ready to serve, warm in a 350°F oven for 5 to 7 minutes. Serve with some of the remaining sauce.